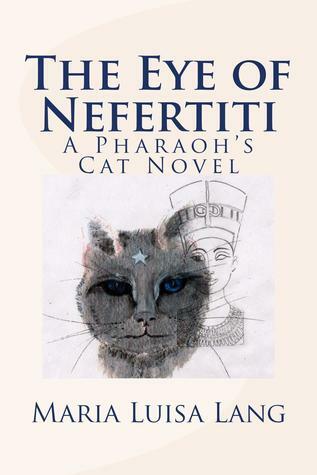 The Eye of Nefertiti is both a stand-alone novel and a sequel to The Pharaoh’s Cat. 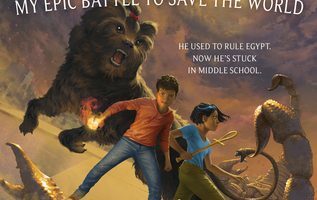 The time-traveling ancient Egyptian feline with human powers returns together with his beloved Pharaoh and his close friends, the High Priest of Amun-Ra and Elena, an Egyptologist’s daughter. The cat is quick-witted, wise-cracking narrator as well as free-spirited, ever-curious protagonist, and the story he tells is an exotic, imaginative, spell-binding tragicomedy. The cat travels from present-day New York City to England, both ancient and modern, then to ancient Egypt, where he confronts a horrible demon and experiences a sublime emotion. Once back in England, he descends into a psychological abyss so deep only the Pharaoh can save him. The Eye of Nefertiti interweaves feline and human, past and present, natural and supernatural. It contains numerous surprises, twists and turns, intriguing characters, both human and animal, fas-cinating revelations about ancient Egyptian history and culture, and an ingenious application of the Tarot and an Italian opera. It’s been a little over a year since I was first asked if I was interested in reviewing Maria Luisa Lang’s first book, The Pharaoh’s Cat and I can still remember being surprised by how much I enjoyed reading it. 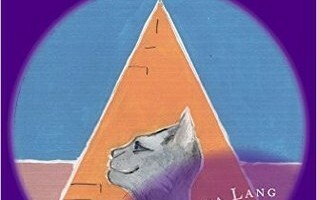 I wasn’t sure if the story of a talking cat set in ancient Egypt was something for adults, but Maria Luisa Lang did a great job creating a fantastic world with these books. 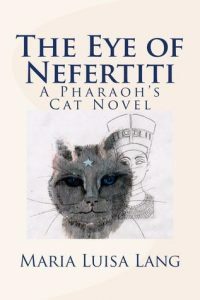 The Eye of Nefertiti is just as charming and entertaining a read as The Pharaoh’s Cat was and I can’t tell people enough about how much I enjoyed reading it. It’s been my experience that most books I’ve read featuring stories told from the point of view of an animal tend to lose their charm and for the characters to get annoying as the story progresses, but happily, that is not the case here. I actually enjoyed reading about Wrappa-Hamen more in The Eye of Nefertiti than I did in the first book, I couldn’t get enough of him. Though I made the mistake of not believing the author when she said this book was a tragicomedy. There were quite a few scenes where I couldn’t decide whether to laugh or cry. Maria Luisa Lang does a great job of making you feel what the characters are feeling throughout the story. I didn’t think last years book gave us nearly enough Egyptian mythology considering the subject matter and time period, so I’m glad that The Eye of Nefertiti more than makes up for that. The author manages to get across quite a bit of information and mythology on ancient Egypt without bogging down the story any. My only real complaint this time around was that I thought the story could have benefited from another pass of the editor’s pen, as there were a few spelling and grammatical errors that jarred me from the story a time or two. Other than that, though, I thought the Eye of Nefertiti was a fantastic read and I will definitely be rereading it again soon. I hope this isn’t the last book in this series as I think Maria Luisa Lang is a great author and I’m looking forward to reading more by her.